If you are into ARM microcontroller programming, you will notice the complexity of setting up a working environment and toolchain unless you are using a limited version of a non-free IDE like Keil MDK ARM or trial version of IAR Embedded Workbench but nothing is like using a totally free environment. 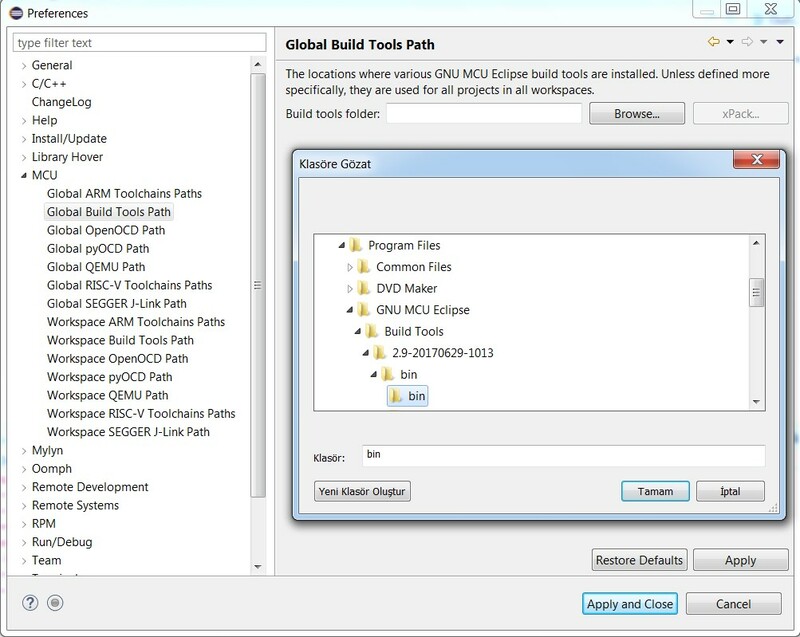 GNU MCU Eclipse project is a life-saver at this point and here is how to setup your environment. Download the following tools suitable for your OS/architecture. GNU ARM Embedded Toolchain (gcc-arm-none-eabi-7-2017-q4-major-win32.exe) Link. Java Runtime Engine (jre-8u171-windows-i586.exe) Link. Windows Build Tools (gnu-mcu-eclipse-build-tools-2.9-20170629-1013-win32-setup.exe) Link. GNU MCU Eclipse IDE (20180419-1818-gnumcueclipse-4.3.3-oxygen-3a-win32.win32.x86.zip) Link. Install the tools with respect to the order given above. Don’t forget to add GNU ARM toolchain to Path by checking the box at the end of the setup wizard. Extract IDE to a folder and run Eclipse. Only the following two settings are needed to be configured before you are ready to go. If you have any trouble with the toolchain, you also have to show its path likewise. The above steps are necessary to get started but there are more thins that you can add to your environment. You should install drivers for your debugger/programmer for example. In addition to these, I don’t blame you if you want to use QEMU for emulation or you can to visualize your registers while debugging by using EmbSysRegView or by installing microcontroller packs. Good luck.